Muslim minorities in Latin America have received considerably less attention than comparable communities in Europe or in the United States. Argentina is home to one of Latin America's largest Muslim communities. Although specific data on exactly how many Muslims came to Argentina in this wave is scarce, there are an estimated 400,000 to 500,000 Muslims, around 1-2 percent of the Southern Cone country's population. 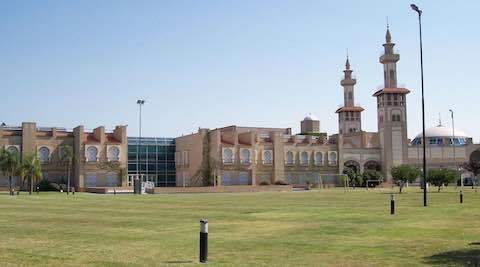 There are also many mosques and cultural centers throughout Argentina, including the Central Mosque, built by Muslim Argentines in 1989, and the King Fahd Islamic Culture Centre, which is the largest mosque in South America. Menem was an already controversial figure in Argentina domestically and internationally. In the early years of his presidency, Menem created institutions with the intent of playing a useful role in eradicating poverty, and improved health programs that promoted AIDS awareness, child nutrition, and vaccinations. Many of Menem's antipoverty policies have had a positive impact on Argentina. Furthermore, he convinced the Unión C'vica Radical (UCR) to pass the country's Quota Law, the first of its kind in Latin America, which gave more women the opportunity to be represented in Congress. However, high crime rates and the Argentine government's lack of capability to respond to the victims of the 1992 and 1994 attacks on Jewish facilities led to his dramatic decline in 1997. Menem's Muslim background pushed him to donate to the Argentine Muslim community. In 1995, he sold 8 acres of land in the Palermo quarter of Buenos Aires to build the King Fahd Mosque, the largest mosque in Latin America, following his state visit to Riyadh. Many Argentine Muslims see this building as the capstone of Menem's legacy. Argentina's largest city, Buenos Aires, is a good example of how religion is preserved in society and how religion dies out. Around half a million Muslims migrated to Argentina in the late 19th century and early 20th century. But now, despite years of national population growth, the number of self-identified Muslim remains around the same. Many Argentine reporters have conducted, "Interviews with Muslim leaders and people who regularly attend the mosques in Buenos Aires [because] they do not believe there are such high numbers of practicing Muslims. "[v] At the Central Mosque, for Jummah prayers, no more than twenty parishioners are usually in attendance. In Argentina, there are a small community of believers, who are converts that attend retreats and social programs in order to share their commitments to spread the teachings of Islam. Many Muslim Argentines would gather on a weekly basis to learn about their faith, the Quran, and the meaning of belonging to an Ummah (Community). In the 1990's, the controversial aspects of Muslim ideology came to the forefront in Argentina. One example of this is the 1992 Israeli Embassy bombing, when a van blew up right in front of the Israeli Embassy in Buenos Aires. This unexpected tragedy "left twenty-three people dead and another 242 injured. "[vi] Another example was the 1994 bombing of the Asociación Mutual Israelita Argentina (Argentine Jewish Mutual Aid Society), a Jewish community center located in Buenos Aires where almost a hundred people were killed. This attack was the largest act of terrorism in Argentina's history. Both attacks fueled a growing anti-Muslim sentiment in Argentina. Many Argentine Muslims felt like outsiders and many Jews and Christians felt that the Argentine government failed to bring suspected terrorists to justice. A breakthrough came in 2011, when the Kirchner Administration passed legislation allowing women to wear hijabs in public without facing persecution. This law expanded the freedom of religion and expression in Latin America, and helped "the Muslim community to better integrate into Argentine society. "[vii] In addition, "according to the new law, Argentinean Muslim women can use photographs wearing headscarves for their national ID cards. "[viii] Although Muslims represent a minority in Argentina, the government is making an effort to ensure that Argentine Muslims are free to express their religion without facing discrimination. Currently, there is an urgency in the Argentine Muslim community to have reliable Islamic teachings in the Spanish language because in addition to the Muslim community in Argentina, there are millions of Latin Americans whose native language is Spanish. The problem for conserving Islam in Argentina is that some Argentine Muslims no longer connect to their faith, and most Argentines do not even consider themselves Muslim, even though their ancestors were Muslim. There is less of a fear for Islam in Argentina than in Europe. According to Waqas Syed, the Deputy Secretary General for the Islamic Center of North America, "Unlike Europe and North America, Latin America has been quite untouched with any of the anti-Islamic rhetoric and the relationship between Muslims and non-Muslim Latinos can be described as excellent and strong. "[ix] Many Europeans and Americans associate Islam with radicalization, but this is not necessarily the case in Argentina. The number of Argentine Muslims is decreasing due to several key factors. Firstly, many customs are being lost including learning about the Islamic culture, religion, and the Arabic language. Many Muslim Argentines only have one Muslim parent and do not know Arabic as the younger generations have learned Spanish as their first language. Secondly, there is very little reading material for native Spanish speakers or texts relevant to Islam, especially the Quran. And lastly, there is a lack of study centers and madrasas (Schools) for Islamic teachings. Many Argentine Muslims have better integrated into their country's culture and they are sometimes not aware of their origins. Latin America: "Argentina's Muslim Minority"